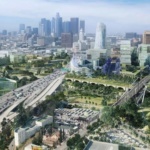 AECOM has a bold, transformational vision for the areas immediately surrounding the Los Angeles River in Downtown Los Angeles. The firm’s recently-published Los Angeles River Gateway proposal envisions a dense web of newly interconnected neighborhoods and recreational areas surrounding a four-mile stretch of the river between Elysian Park and the Chinatown, Lincoln Heights, Boyle Heights, Arts District, and Civic Center neighborhoods. The plan calls for nearly 300 acres of publicly-accessible riparian areas surrounding the river. 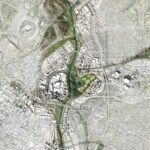 Those recreational and flood-control areas would be joined, according to the plan, by 36,620 residential units, including at least 7,874 affordable homes. 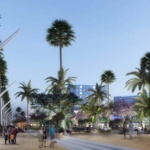 The plan calls for making 100 percent of the riverfront areas accessible to the public by absorbing the surrounding industrially-zoned lands and converting those parcels to park areas. 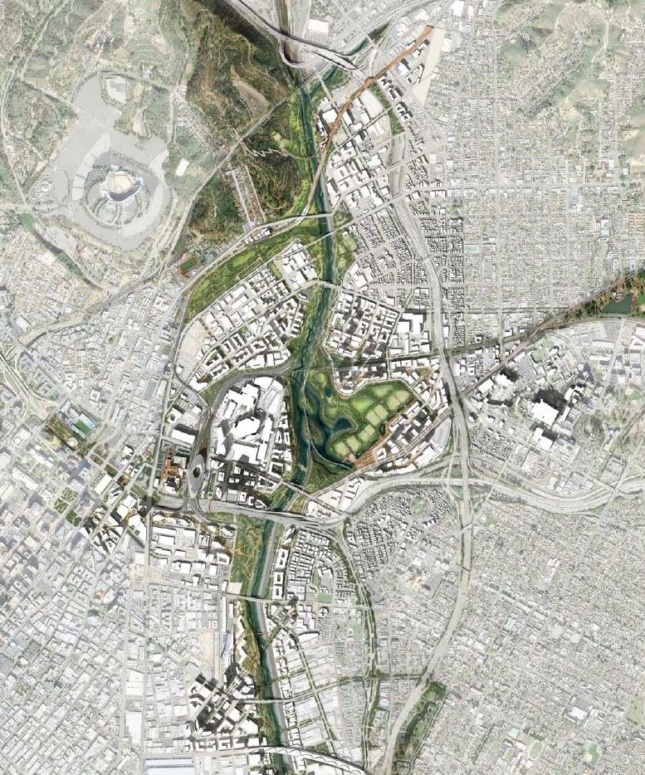 The unsolicited study seeks to join “the city with [the] river and nature” by physically connecting the neighborhoods surrounded by the L.A. River with the river itself. 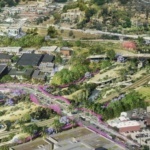 It also works within the confines of existing neighborhood plans and leans on already-approved proposals to paint – not a radical vision for the future – but something more akin to a visualization of what the built-out area might eventually look like under current plans. AECOM proposes a series of approaches for bridging over privately- and publicly-owned rail yards surrounding the river’s banks on either side, including plans for underground tunnels that would serve high-speed rail, public transit, and private freight trains. Other potential options include the erection of an elevated trestle system for trains that would allow pedestrians to walk below the tracks and a fill-and-mound system of terraforming to span over the tracks. The River Gateway proposal also calls for adding nearly 150,000 jobs to the area, a 200% increase over the existing number of jobs currently contained within the study areas, according to the authors. Under the plan, 97% of the area’s jobs would be located within a 10-minute walk from the handful of existing and forthcoming light rail stops that serve the area. 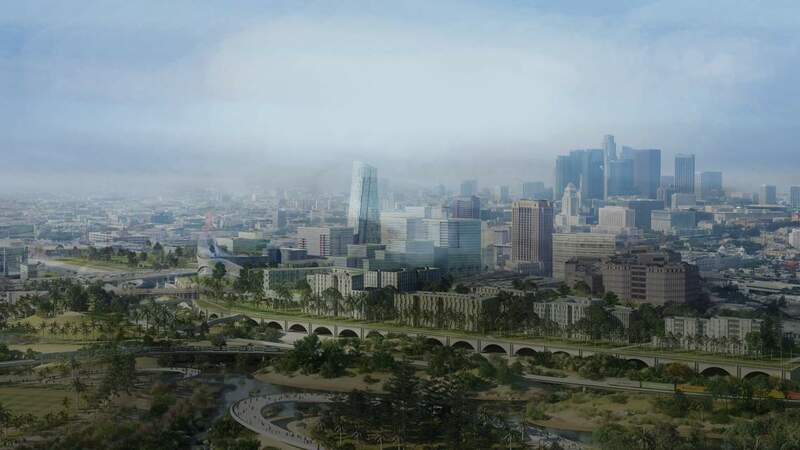 Renderings for the scheme depict sweeping, tree-filled vistas of the areas surrounding the river, with the areas around Union Station particularly transformed by new structures. The renderings show the City’s brutalist Piper Tech records and police facility being replaced by mixed-use housing towers, for example. Low- to mid-rise apartment blocks would flank the riverbanks on both sides and ultimately bleed into realized visions projected under the new Civic Center Master Plan. The Los Angeles River Gateway plan calls for a 40-year implementation schedule, with many of the improvements either begun or partially completed in time for the 2028 Olympic Games. 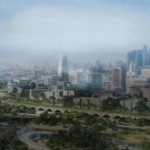 Under the plan, the downtown section of the L.A. River would act as a “gateway” for Olympics visitors. A full version of AECOM’s proposal can be found here.